Sabah's most visited destination is Mount Kinabalu. Since becoming Malaysia's first world heritage site in the year 2001, every year as many as 35,000 people around the world have climbed to the summit of Mt. Kinabalu, at 4093 metres. Climbing experience is needed to scale this mountain, average fitness will do. Watching sunrise at Low Peak, the highest point of Mt. Kinabalu, has been an unforgettable experience for the climbers. If Mt Kinabalu is not on the itinerary, then trekking in the park is the next best thing. There are many trails throughout the park, some starting and ending at the park’s headquarters entrance. Other than hiking, visitors can explore Kinabalu National Park that boasts over 5,000 plant species consisting of orchids, ferns and the exotic Rafflesia plants. It is also home to a multitude of endemic animal species, including the Kinabalu Giant Red Leech and Kinabalu Giant Earthworm. The park also plays host to a variety of birds, insects, mammals, amphibians, and reptiles. Take the Kota Kinabalu-Ranau road. At about 91km (immediately passing the Bundu Tuhan junction), there is a small gate with a road leading down the valley. One can see the Ayana Holiday Resort signboard near the roadside. If you come from the direction of Kinabalu Park Entrance, a less than 1.3-kilometre walk will get you to Ayana Holiday Resort. That&apos;s roughly 5 to 10 minutes of walking from the entrance of Kinabalu Park towards Kota Kinabalu. For independent travellers, there is a daily bus from Kota Kinabalu to Ranau leaving at 8:00 am near the Padang Bus Station. Budget taxis which only leaves with full capacity of 4 passengers can also be located there too. Mount Kinabalu is the highest mountain (Gunung Kinabalu in Malay) in Malaysia and lies within Kinabalu National Park (NP). Its summit reaches 4,095.2 meters. From the summit you will have the best view of the rising sun, and when you walk down, you can see several small villages. With good weather you will even be able to see Sabah's biggest city, Kota Kinabalu, at great distance. Visiting the mountain is not easy without any pre-planning; you will have to register in advance, best way to do this is with the help of an agent or travel organization. The Local government only accepts around 150 people on the mountain at all days, this means only 75 people can go up daily; as the other 75 are doing their descent at the same time. The permits often run out during peak season, so remember to make the necessary arrangements beforehand. Read more about Mount Kinabalu at Wikipedia!. Looking for a simple and affordable place to dine around Kinabalu Park? Look no more, Panataran Kinabalu Restaurant is the place to be, and it is located right at the entrance of Kinabalu Park. This restaurant is popular with Kinabalu park visitors, and passers-by to Ranau and Poring Hot Spring. The main cooking style here is Asian and Chinese with some simple Western food. Major meat selection in the menu is beef and chicken, with only a small selection on fish and prawn. For Chinese dishes the popular ones found here are fried noodle dry or wet, lemon chicken, sweet & sour fish, and ginger beef. For Asian delights the menu includes Beef Rendang, Chicken Curry, Sambal Prawn, and Tom Yam. Western sets like French toast, salad, sandwich and omelette are available. This restaurant serves no pork. Price per dish ranges from RM6-10. Hot coffee or tea cost only RM1-2 per cup. 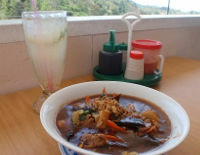 The Bayu Kinabalu Restaurant offers simple western and local food. Guests can dine out at the outdoor porch and enjoy the cool weather of Kinabalu Park, or choose to dine in to avoid the cold wind. The car park area just outside Panataran Kinabalu Restaurant went through a major renovation in 2010. As many as twenty vehicles, including coaches and buses, can park here at any given time. Price guide: toast with butter and jam (RM2.50-3.00), mushroom omelette (RM4.50), and lamb chop (RM16.00-20.00). Kundasang is a town in the district of Ranau that lies along the bank of Kundasang Valley. It is renowned for its vegetable market which is open seven days a week. It is the closest town to Mount Kinabalu and has a panoramic view of the Mountain. It is populated mainly by the native Dusun and a small population of Chinese people. Almost all the shops are operated by locals. Established in 1962, this was one of the first memorials to commemorate the brave Australian and British Prisoners of War (POW) who died in Sandakan and during the infamous death marches to Ranau during World War II. The memorial also remembers the people of North Borneo who risked their lives to help the POWs. The Memorial is made up of four beautiful gardens - the Australian Garden, the English Garden, the Borneo Garden and the Contemplation Garden and Pool - to represent the different nationalities. Visitors can also opt to view a brief video on the history of the Sandakan Death March. The real attraction here is the cattle farm, producing about 900,00 litres of milk per year. The farm is 199 hectares and most of the milking cows are Friesians, the highest milk producers of all cattle breeds. Poring is located in the lowlands - a contrast to the Parks HQ. Visitors can de-stress and soak away sore and aching muscles in the spring's hot sulphuric mineral waters, deemed to have healing properties and very popular among the locals. Other than the natural hot springs, there are also other interesting areas in the park to be visited such as the butterfly farm, the Poring Orchid Conservation Centre, the tropical garden, the Poring canopy walkway, and the Rafflesia flower site. This is the only organic tea farm in Borneo and one of handful in the world. A trip to the tea garden is both educational and fun - visitors can enjoy a variety of recreational activities such as obstacle-crossing in the Sapaon Recreational Area, trekking along the trails to the peak of Kamunsu Hill or embarking on a night walk to check out the unique insect life. In the Local Kadazan-Dusun dialect, tagal means "no fishing", and the main purpose of the tagal is to preserve the environment as well as the ecosystem to benefit the future generation. These fishes are specifically trained by the villagers to perform the healing massage activities.